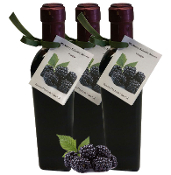 Blended with real fruit, this Blackberry Balsamic Reserve Vinegar is made in Modena, Italy. Perfect for glazing your favorite meats, makes delicious salad dressings, and some people love it as a topping for vanilla ice cream. Delish pasta imported from Italy. Closest thing to fresh pasta, a real treat! Yum! A customer favorite. The smooth, buttery Mission oil flavored with garlic. An excellent gift! Mission olives were pressed with organic lemons to create this spicy lemon delight.